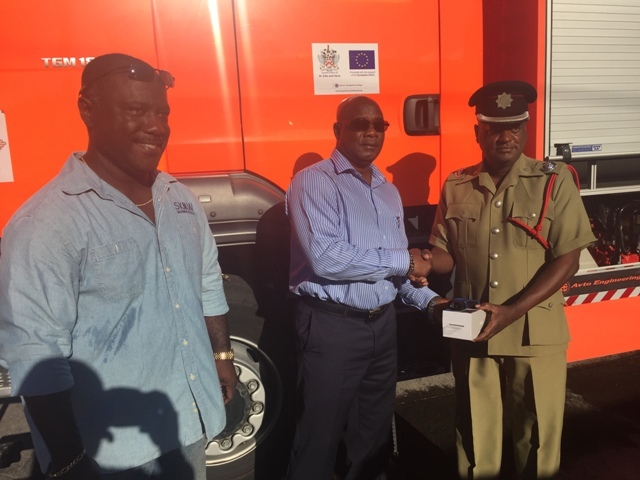 NIA CHARLESTOWN NEVIS (JANUARY 21, 2016) — Two pieces of high-tech equipment were donated one each to the Royal St. Christopher and Nevis Police Force (RSCNPF) and the St. Kitts and Nevis Fire and Rescue Services (SKNFRS) divisions on Nevis at their respective head offices in Charlestown on January 19, 2016. Director of St. Kitts Marine Works Ltd. Regiwell Francis, who presented the gifts, said they were to show gratitude for the Nevis Island Administration’s decision to award his company with a contract to extend the Tender Pier and the Fisherman’s pier in Charlestown in 2015. Mr. Francis, handed over a thermal imaging camera to Minister in the NIA Hon. Alex Jeffers during the first presentation. He said the equipment is intended to assist with fighting fires, detect hot spots and prevent them from rekindling and to upgrade the technology used by the fire fighters. “It will increase the efficiency of the firefighting operation. It’s very small, very compact, total state-of-the-art technology. We are trying to keep Nevis and the Federation up to date. We intend to hand one of these to Basseterre firefighting and one to Sandy Point. In response, Mr. Jeffers who handed the equipment to the SKNFRS Divisional Fire Officer David Stapleton thanked Mr. Francis for the gesture and stated that the equipment would enhance the efficiency and professionalism of the fire offers stationed on Nevis. DFO Stapleton recorded thanks to Mr. Francis on behalf of the SKNFRS, Nevis Division. He described the gift as a small but powerful piece of equipment which not only detects infrared thermal imagery in buildings but in case of a rescue operation it has the capability to detect any victim that is motionless in a building. Meantime, the police were presented with a piece of equipment, the name of which was not disclosed, for use in their crime fighting efforts. 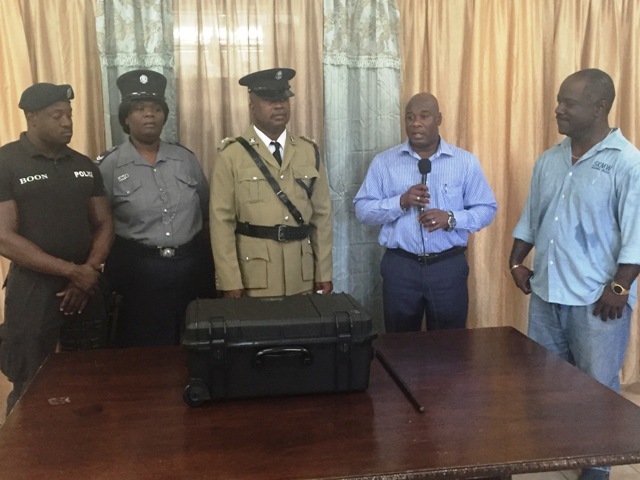 Inspector Conrad Bertie, who accepted the equipment from the local entrepreneur through Hon. Jeffers, expressed gratitude on behalf of the Commissioner of Police, the rank and file of the Royal St. Christopher and Nevis Police Force and the Nevisian community for the donation, which has the capability to serve as a crime deterrent. The Senior Officer noted that the Nevis Division’s theme for 2016 is “Fostering Community Relations to Ensure Crime Prevention” and he gave the assurance that the timely donation would be put to good use. He said they expect to see results from the division owing to the gift.